We offer the best value, the best location and the best atmosphere...come see for yourself why we are so popular in Inverness! We’re very clean and offer free luggage storage after check-out, free Wi-Fi, free overnight parking (7pm to 7am – there is also 24-hour parking nearby for only £4). 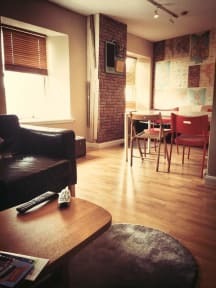 We are a modern, lively, fun-filled hostel just yards from the main bus station in the centre of town and five minutes’ walk from the train station. If you’re looking for fantastic budget-priced accommodation with a friendly atmosphere then look no further. 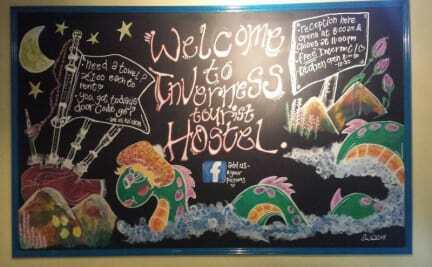 Inverness provides an excellent base to explore the highlands and islands of Scotland. The city has many attractions, including the museum and art gallery, Inverness Castle (with the castle garrison encounter exhibition) and of course the legendary Loch Ness monster around the corner! Inverness is also home to some of the best award-winning live music bars in Scotland as well as restaurants providing amazing food and value. For all you Outlander fans, Culloden battlefield and the Clava Cairns (inspiration for Craigh na Dun) are a short bus ride away. There are also many tours offered by various companies that explore Inverness, Loch Ness, Glen Affric and many other places of interest. We have four-, six-, eight- and 10-bed mixed dorm rooms, each with new, comfortable mattresses. There’s hot water 24/7 because of our modern electric showers. We have a fully equipped kitchen and there’s free tea, coffee, milk and sugar all day. Our comfortable common room features a 42-inch plasma TV. Come play our piano or strum on our guitar – we love musicians! The hostel is very well-located, next to the bus station. The rooms are good and the restrooms are always clean. I only have some compliments: 1. The kitchen closes at 22:30 (if u spend all the day outdoors, travelling by Highlands, it will be hard arrive at night and cook something). 2. The staffs are blazé. 3. I dont know why but the people who stayed in my room made too much noise in the evening and in the morning. The staffs didn't do anything to stop it. I never return in this hostel. It is disgusting. I never see too much dust and big hole on wall. The shower everything was black, mean the cleaner doesnt clean. I bought the products because I cannot take shower there. I took photo to prove. Toilet one layer of dust, floor doesn't have color. The sink around the tap is black. In the room the window is full mound, curtain is fallen down and below the bed a lot can of Coca Cola, set up, water bottler. sorry I can't say good thing. If you like comfortable beds or using the bathroom, don't stay here. They have 3 bathrooms for 50 people, in the morning is impossible to use it, we literally had to go to the bus station to brush our teeth and wash our face before leaving. Beds are old and squinky, mattresses are so thin we can fell the bed frame. Location is good, but not enough to compensate the cons.